Home › News › Celebrating our Latest Inspection Report! 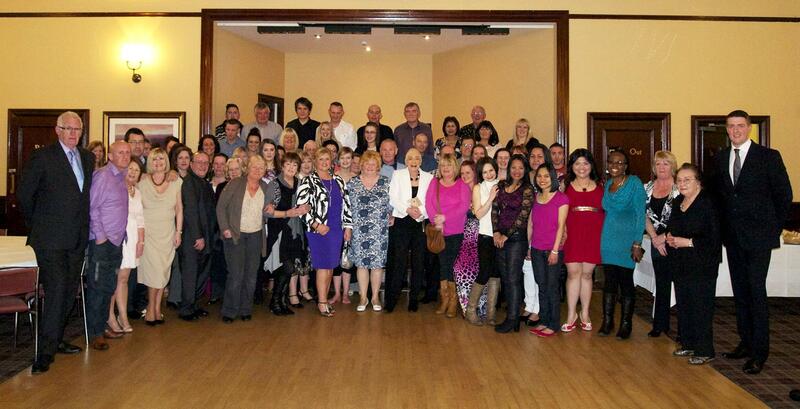 Some forty Helensburgh staff, family and friends, seen here at a party at the Commodore Hotel on 01 March, held to thank staff for their hard work in achieving an outstanding Care Commission Inspection Report. A similar party is planned for the staff in Oban! Carers Direct Ltd was founded in 1996. Denis McGlennon, the current owner, managed and then bought the business in 1997. Pauline Forrest became Care Manager, a post she held for over 10 years until Ann Don took over as the new Care manager in 2010. In 2005 the company acquired a care business in Oban, and now has two excellent Coordinators in Rhona Collins and Gillian MacKenzie, as well as some 20 carers covering Oban and the surrounding areas. Ann’s enthusiasm and professionalism, coupled with that of all staff past and present, has continued to contribute to the growing success of the business. Denis Jnr was promoted to Director this year to strengthen the Management team. In February this year (2013) the company achieved its highest grades yet from the Care Inspectorate: 3 ‘Excellents’, 2 ‘Very Goods’ and 1 ‘Good’, giving Carers Direct at the time the highest grades out of some 15 local companies – including those awarded contracts to provide Homecare to Argyll and Bute Council – which is testimony to the excellent hard work done by all. The business is managed from Helensburgh, although clients are now spread over a growing area – Mid Argyll, Oban & surrounding areas, Colonsay, Tiree, Dumbarton and Helensburgh & Lomond. Denis’ Daughter Paula Forbes runs an excellent office with a team of three. There are now some 120 service users who have a range in needs from hourly assistance to more complex tasks such as 24 hour care 365 days a year to enable them to stay at home rather than in a hospital or Care Home. Carers Direct has a new website which provides details on the services offered, news and latest Care Inspectorate reports. It is the company’s stated aim to continue to Provide Outstanding Personal Care and Support.